A tank-mounted strainer (either suction or return) can be installed through a tank top by welding a standard bell reducer (coupling) over a hole cut in the top. A standpipe, threaded into the coupling, need be only long enough to stay below the lowest fluid level encountered. The strainer may be removed for servicing without draining the tank. Flow Ezy tank-mounted strainers and diffusers install through the side wall, or through the tank top and into a standpipe. Either way, they can be removed through the hole in which they are mounted, and access to the tank interior is not necessary. They're made in three styles: for suction straining, return-line straining, or return-line diffusion. Diffusers have no wire cloth elements; their function is to reduce foaming, tank noise, need for baffling plates, and pump cavitation caused by flow disturbance at the pump inlet. 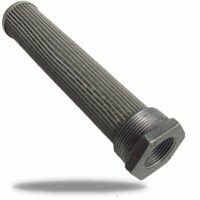 Strainer elements are offered in 30, 60, l00, or 200 mesh size. Bypass relief valves can be supplied, built in. These products most commonly have a male NPT, to mount to the tank. A male SAE straight thread is also offered. Several methods of connecting fluid lines exist, the most common being into a female NPT. (A female SAE straight-thread is also offered.) Hose connections, either beaded or barbed, are available too. There's a wide choice of materials of construction. The standard (and least costly) units have a cast iron bushing, steel support tube, and stainless steel wire cloth element. Also offered are models with forged steel bushings, or an all-welded, all stainless steel unit (no epoxy). Brand: Flow Ezy Filters, Inc.
View More In Suction Strainers. If you have any questions about this product by Flow Ezy Filters, Inc., contact us by completing and submitting the form below. If you are looking for a specif part number, please include it with your message.